Image from Instagram. Unknown source. Near the end of October I posted about seeing a new trademark from Urban Decay for a product called NAKED ON THE RUN which I originally thought we'd see in a few months however I also found the page for it on Urban Decay's site and normally they don't launch pages or host page names until the product is getting ready to launch. It came to my attention that a photo of the palette is out on Instagram! Well my long time readers know me well enough to know I'll track down official pics when I can. The new NAKED ON THE RUN palettes comprises of five eye shadows, a blush/bronzer combo and a highlighter however that's not all that comes with it! 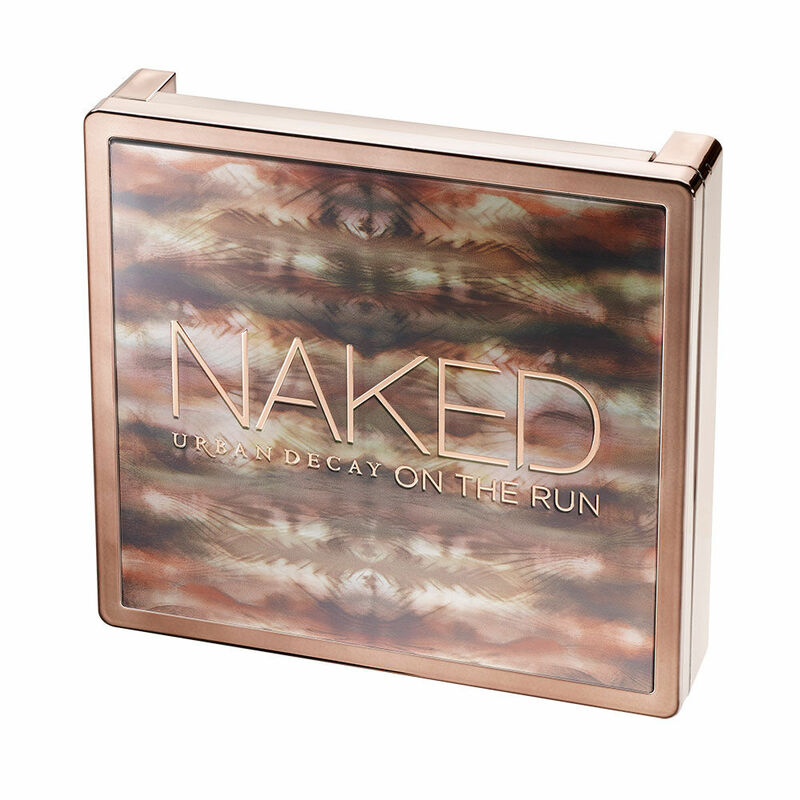 NAKED ON THE RUN will also come with a travel size liner in STAG, PERVERSION mascara and a lip gloss. I'm not 100% sure but it looks like the mascara and lip gloss are both full size though most likely it's a deluxe. Once Urban Decay releases more info I'll update this post. 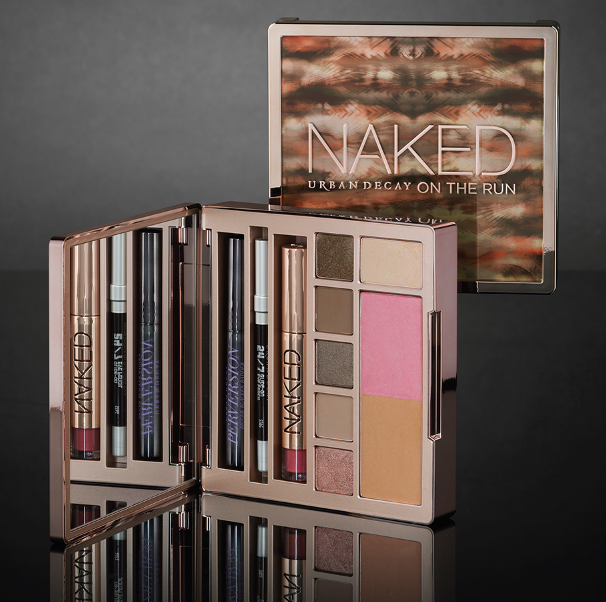 Available on Urban Decay on November 20, 2014 and launches in stores on December 4, 2014 for $54. A closer look at the NAKED ON THE RUN palette colors. UPDATE! Urban Decay's website has finally released the info. You never know when (or where) you’ll have the urge to get Naked. 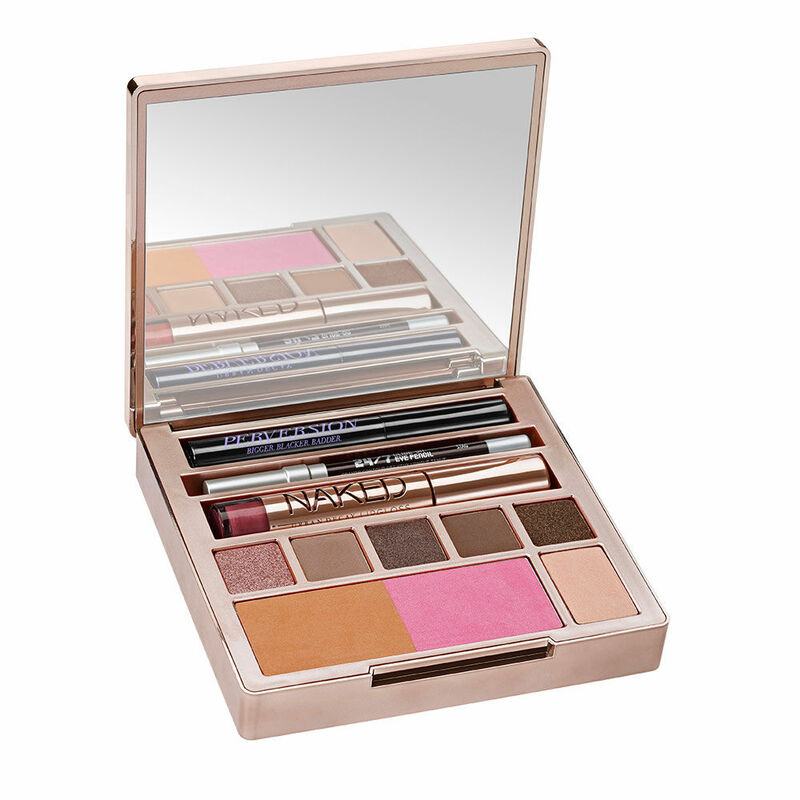 This travel-ready kit comes loaded with EVERYTHING you need for a complete Naked look. While our Naked palettes travel beautifully, sometimes you really have to maximize every last bit of space in your carry-on. Enter Naked on the Run—a LIMITED-EDITION, all-in-one Naked palette. The ultimate travel kit for Naked junkies, this palette comes loaded with EVERYTHING you need for a complete Naked look: six ALL-NEW shades of Eyeshadow (including an extra large dose of the perfect all-over shade, 5050). Bronzer. Blush. We even included a full-size Naked Ultra Nourishing Lipgloss and a travel-size 24/7 Glide-On Eye Pencil (both new shades), plus a travel-size Perversion Mascara. 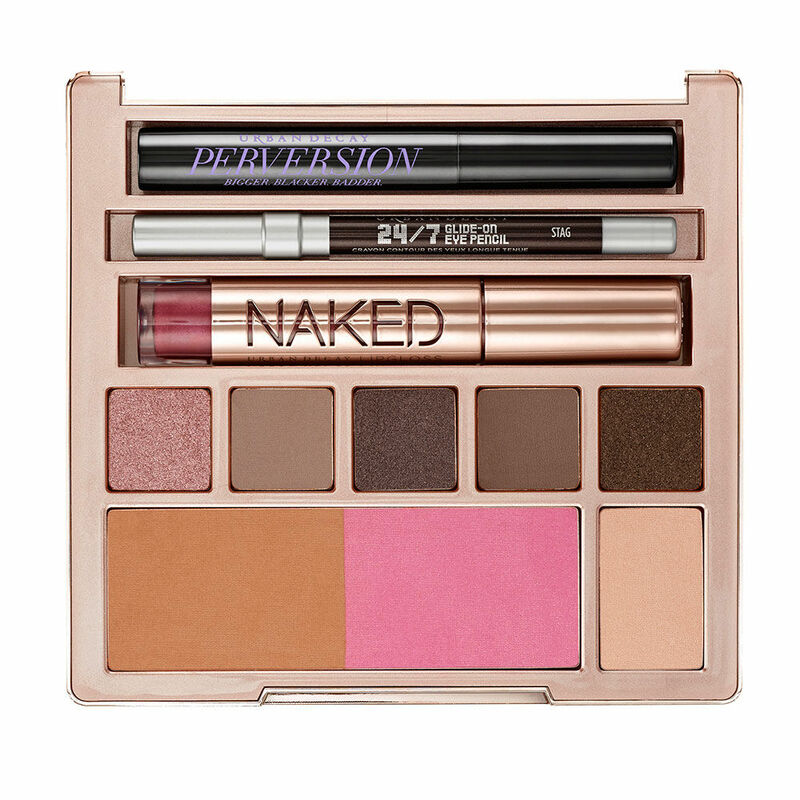 This palette is the ONE thing you need to easily create a complete Naked look on the run. (And let’s not forget that every single shade inside is new!) We obsessed over the lineup until it was just right, carefully crafting the perfect mix of neutrals for day and night. Each shade in Naked on the Run is designed to work perfectly together and makes it easy to create a range of looks—from simple and Naked to sultry Naked. With a lot of all-in-one palettes, you run out of lip color long before everything else. Not so with Naked on the Run, because the Naked Lipgloss is FULL-SIZE. When you want to change up your look, just swap out the liner and the gloss for your favorite UD shades. Eyeshadow: Dive (metallic rose w/golden micro-shimmer), Fix (soft taupe matte), Resist (medium metallic taupe), Dare (medium brown matte), Stun (metallic bronze w/light gold micro-shimmer) and 5050 (cool bisque satin). Bronzer: medium bronze matte. Blush: vibrant pink w/light shimmer. Perversion Mascara: blackest black. 24/7 Glide-On Eye Pencil: Stag (deep brown satin). Naked Lipgloss: Sesso (rose w/pink shimmer).